The Philpott Tennis Fund continues to grow and summer 2015 was no exception. 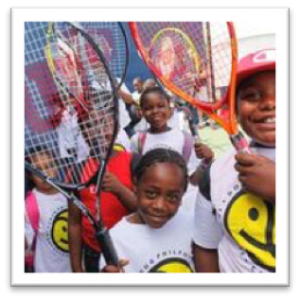 This summer consisted of thirty-seven tennis instructors, three supervisors, eighteen sites and over 8,000 campers and the feedback from campers, parents, staff, volunteers and Community Recreation Programmers and the City of Toronto has been incredibly positive. Every morning for seven weeks we provided free tennis lessons at the following sites: Antibes Community Centre, Cabbagetown Youth Centre, Clairlea which provides courts for West Scarborough Boys and Girls Club Aquatics, Dovercourt Park which provides lessons for the Dovercourt Boys & Girls Club, MacCauley and Swallows Daycare, Flemingdon Park Community Centre (CC), Grandravine CC, Jimmie Simpson Community Recreation Centre (CRC), John Innes CRC, Kingsview Village CC, Lawrence Heights CC, Malvern CRC, Amesbury (CRC), McGregor Park CRC, Parkdale CRC, Oakridge CRC, Secord CRC, San Romanoway and L’Amoreaux Tennis Centre. And the Philpott camps are growing…This summer, in addition to morning lessons at our newest site Secord Community Centre, we added afternoon lessons to accommodate another branch of the Scarborough Boys and Girls Club and the Community Neighbourhood Association. Once again we set up afternoon lessons for the West Scarborough Boys and Girls Club at the Oakridge courts. 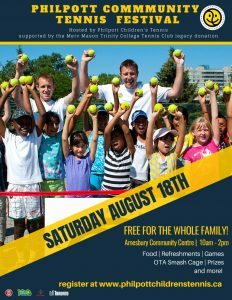 L’Amoreaux Tennis Centre provided courts for the North Scarborough Boys and Girls Club in the morning and for the L’Amoreaux Community Centre in the afternoon. The site at Winchester Public School provided lessons for so many children from the Wellesley Community Centre and the Cabbagetown Youth Centre, that we once again had to add a third instructor to the teaching team. Flemingdon Community Centre was the site of this year’s Toronto Sports Leadership program. Several youth attended this program every day for 7 weeks. 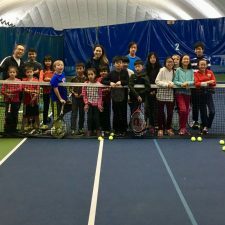 They volunteered with the younger children and spent an hour and a half each day working with our instructors to reach a 3.0 level of tennis ability. The successful participants will work with the City of Toronto during the winter and attend seminars on childcare, first aid, resume writing and interview techniques. We are also planning to provide on court training for these candidates in January, February and early March so they will be ready to attend the Tennis Canada Level One certification course during the March break. Once a youth receives their Level One certification, we offer them paid employment as Philpott tennis instructors. To date we have had 10 Philpott instructors come through this program. Several are now teaching tennis in the neighbourhoods where they grew up, having learned their first tennis as Philpott campers. They are exceptional leaders and mentors to our campers. We are thankful for the support of the Toronto tennis community, individual donors and Toronto’s largest private tennis clubs, namely The Cricket Club, The Toronto Badminton and Racquet Club, The Toronto Lawn Tennis Club, The Granite Club and The Boulevard Club. This year our major financial partners include Tennis Canada, Canadian Tire Jumpstart Charities, Emirates Airline, the Philpott Ladies Invitational, (hosted by the Toronto Cricket Tennis Club) and the Davisville and Leaside Tennis Clubs. We are extremely grateful to Wilson Sport and Emirates for their generous donations of equipment. Once again the Racquet Donation Program was a tremendous success and we gave away over 500 donated, gently used racquets and a new can of tennis balls for each gifted racquet. Talks are continuing with the City of Toronto to formalize the agreement between the City and the Philpott organization. This agreement will strengthen our relationship with the City and ensure ongoing permitted use of the city’s tennis courts and a protocol for camper registration. The City of Toronto has also recommended five more neighbourhoods that would benefit from Philpott tennis lessons. In consultation with the Philpott Tennis Committee and the Philpott Board, two additional sites may be added next summer and we hope to phase in the other sites over the next couple of years. As the city official said “Toronto loves the Philpott program”. Toronto gets free tennis programs on its courts and the children living in priority needs neighbourhoods get free tennis lessons. The campers get an opportunity to learn valuable lessons about fitness, cooperation, discipline and self-confidence. Once again thank you for all you do to make this most significant program happen for the children of Toronto living in priority needs neighbourhoods.